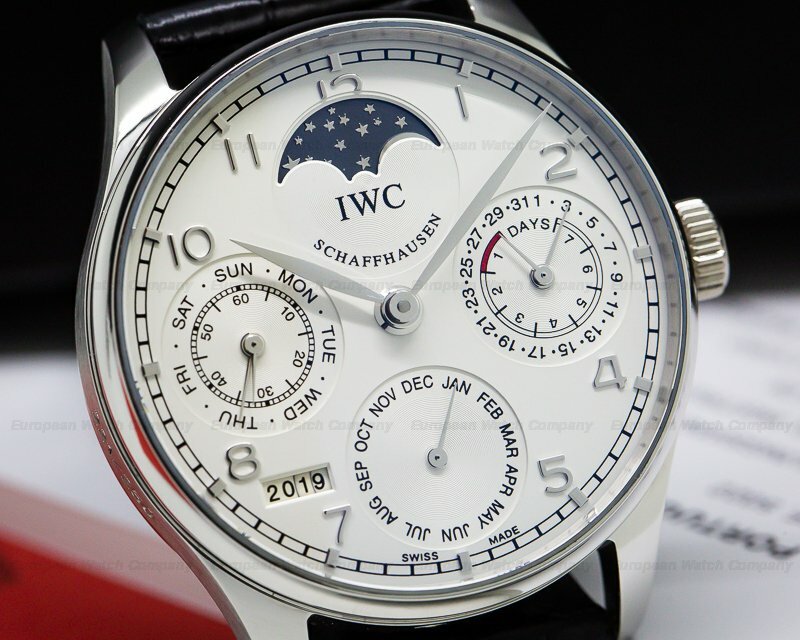 This is a platinum IWC Portuguese Perpetual Calendar II Limited Edition IW5022-19. 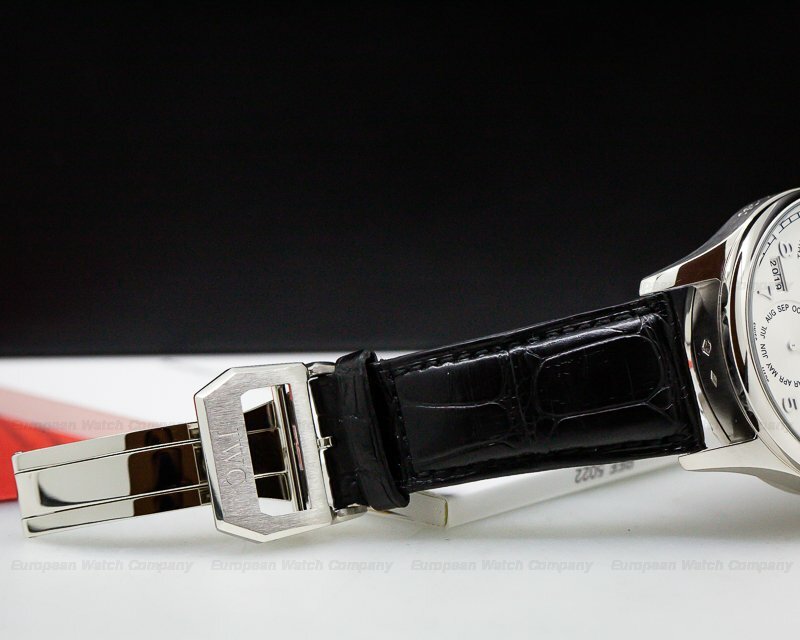 It has a leather strap with a matching platinum deployment buckle, and a scratch resistant anti-reflective sapphire crystal. 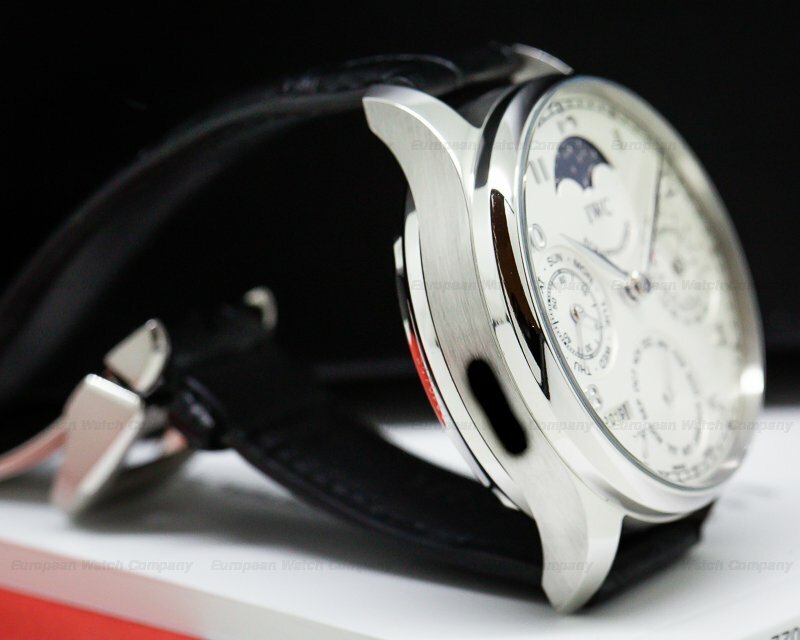 The 42.3mm diameter solid thee-body case, stepped concave bezel, downturned lugs, and screwed-down transparent sapphire display case back are polished. 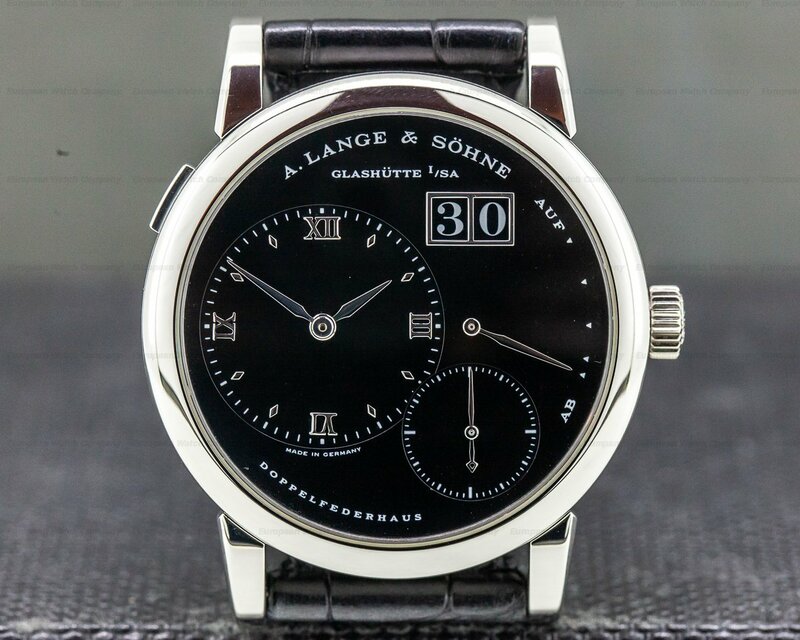 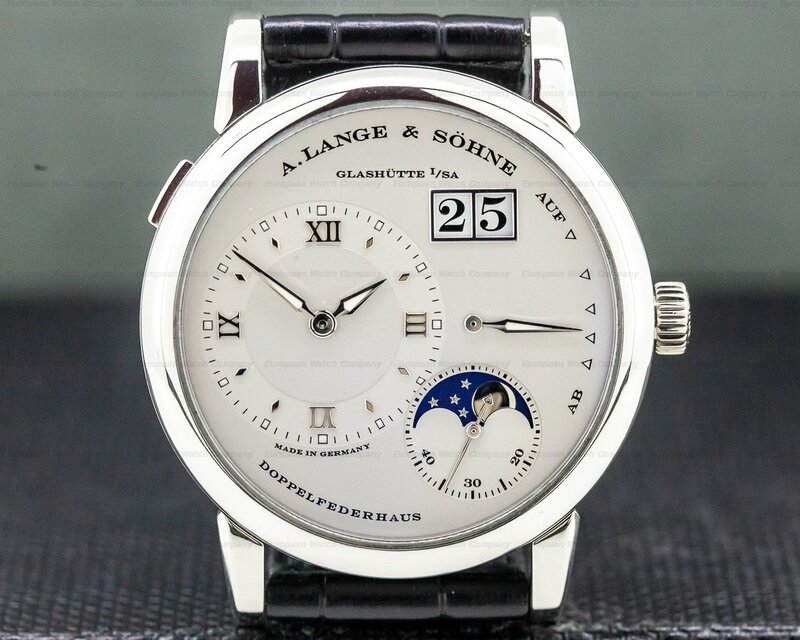 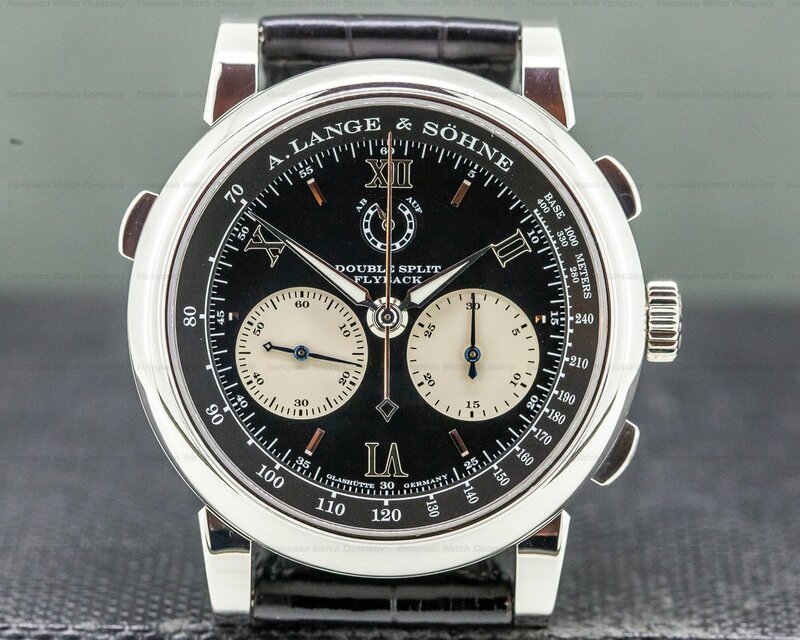 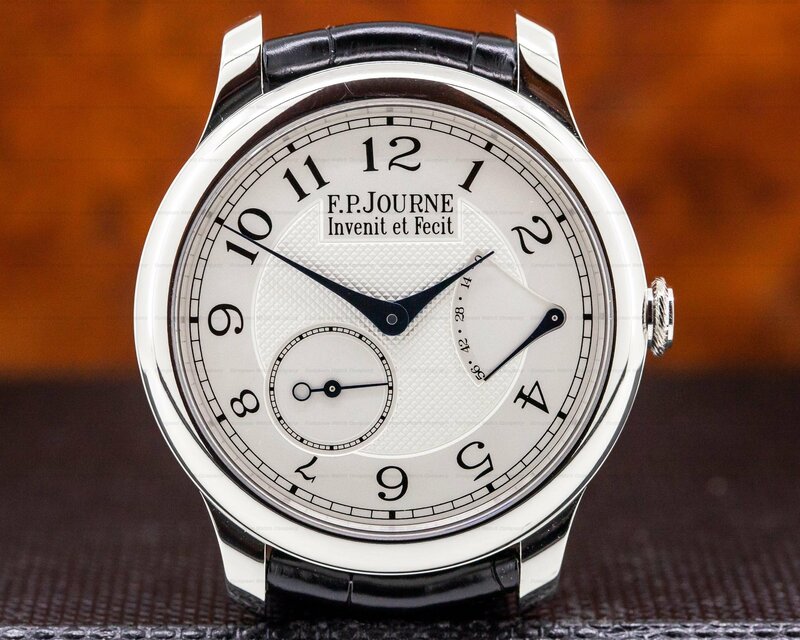 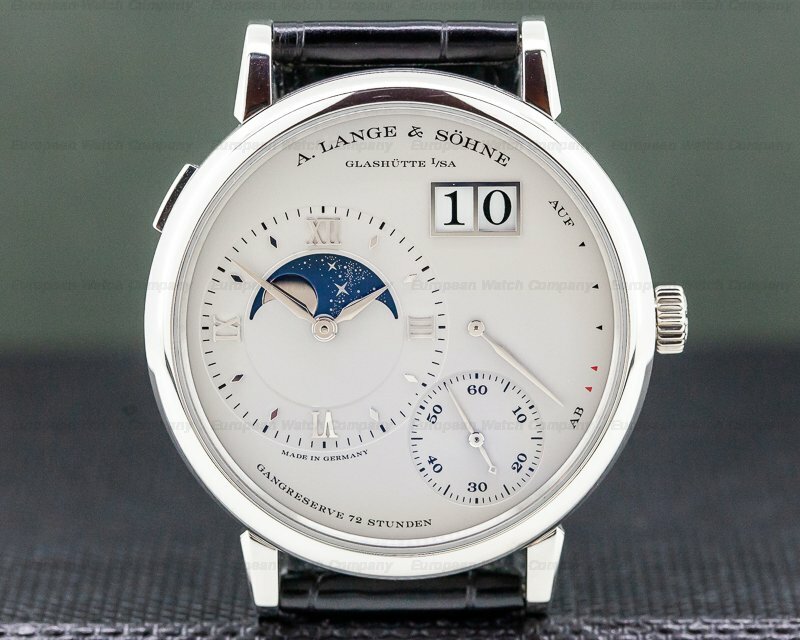 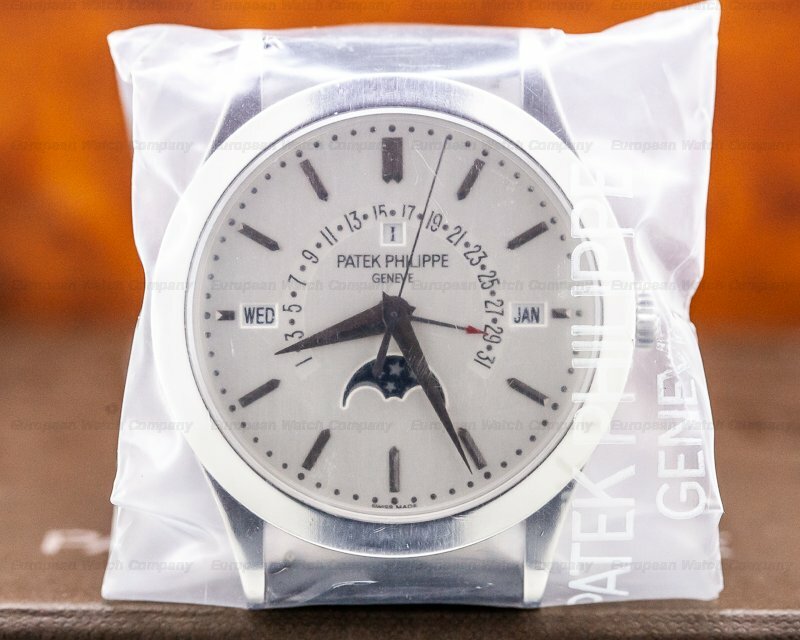 The dial is matte silver with applied platinum Arabic numeral hour markers and square indexes, and there is an outer track with minute divisions and platinum feuille hands. 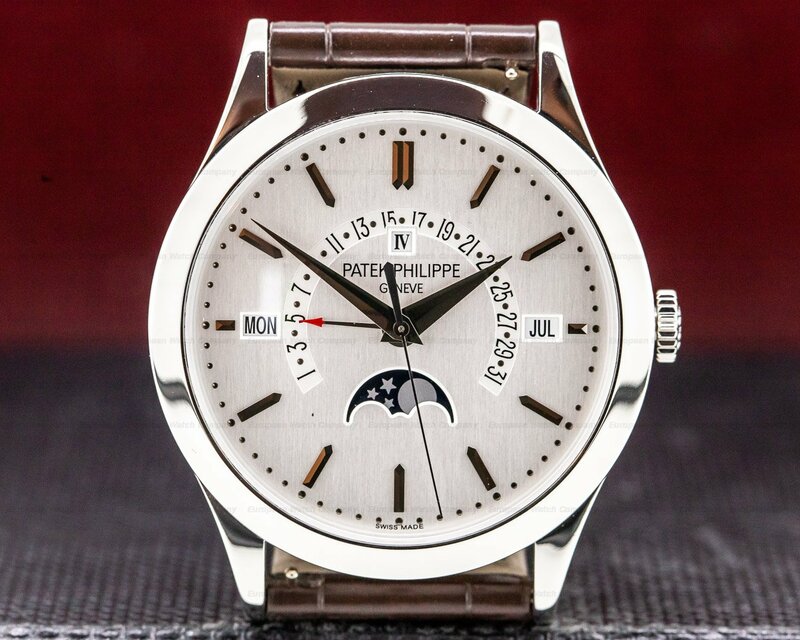 The perpetual calendar has a moon phase subsidiary dial at the 12 o'clock position, a month indicator dial at 6 o'clock, a combination day and constant seconds dial at 9 o'clock, and a totalized date and 7-day power reserve indicator at 3 o'clock. 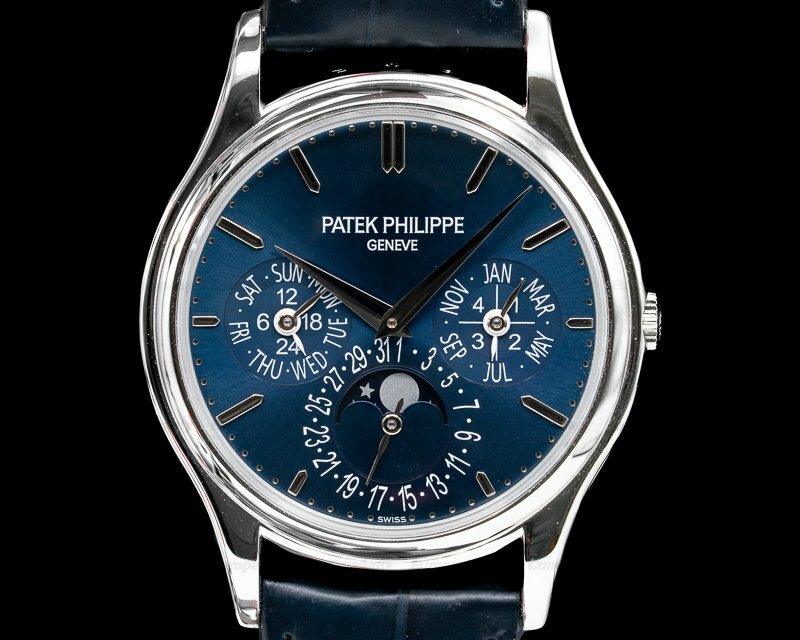 A four-digit date aperture is between 7 and 8 o'clock. 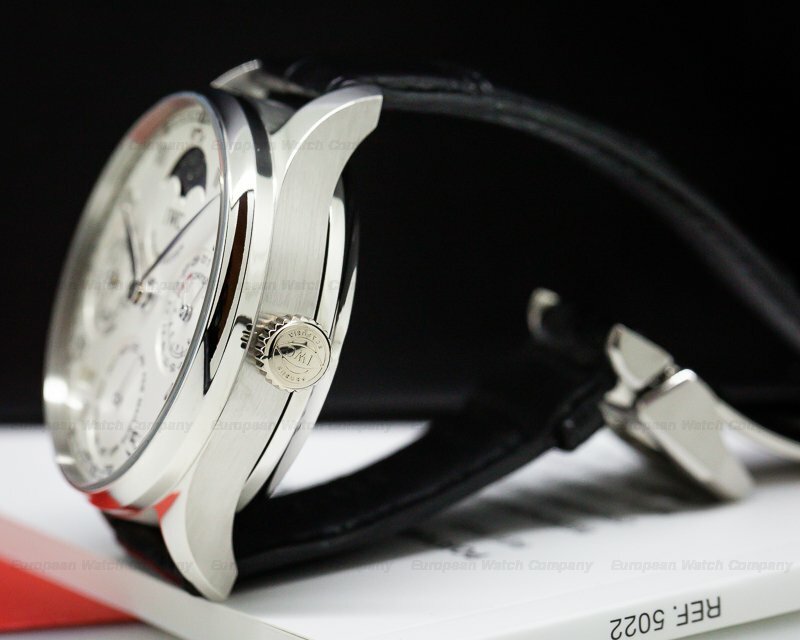 It's water resistant to 30 meters/100 feet, and the 15.6mm thick case, dial, and movement are all signed. 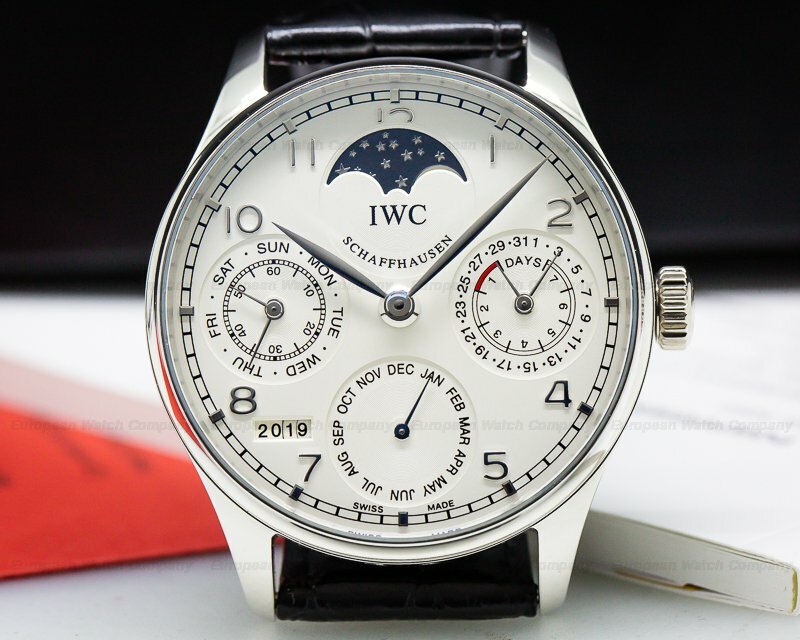 This IWC Portuguese Perpetual Calendar II Limited Edition IW5022-19 has a mechanical automatic self-winding IWC caliber 51610 movement that's rhodium-plated, with fausses cotes embellishment. 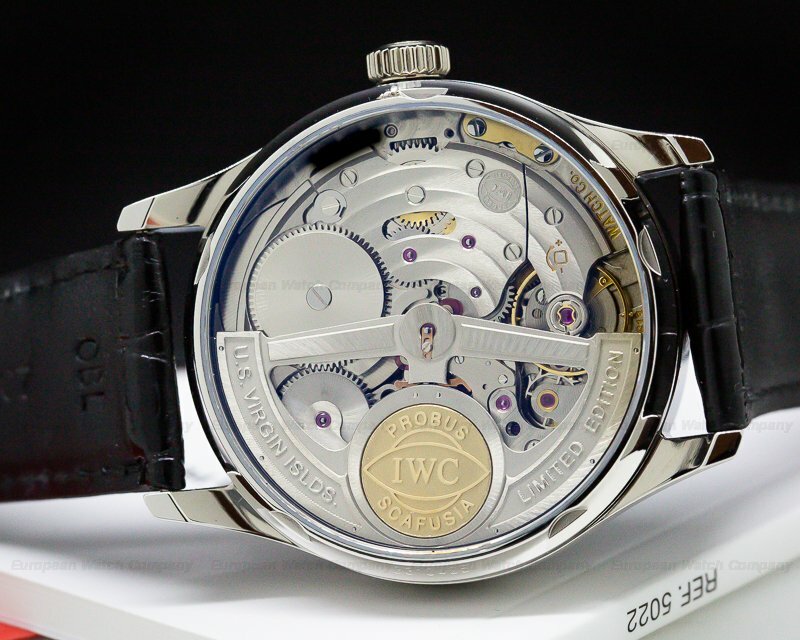 It's constructed with 64 jewels, a shock absorber mechanism, and a straight-line lever escapement. 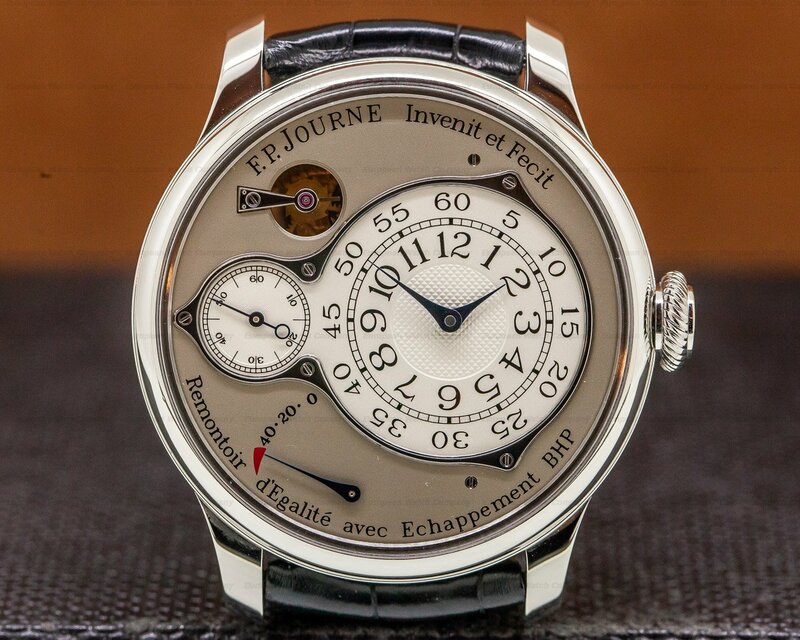 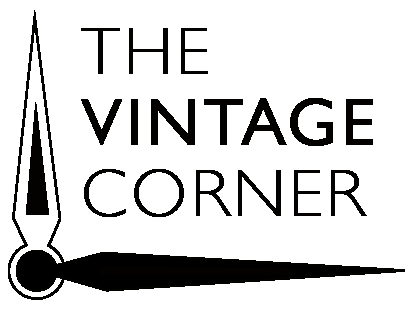 It includes a monometallic balance that's adjusted to 5 positions, a self-compensating Breguet balance spring, and a micrometer regulator. 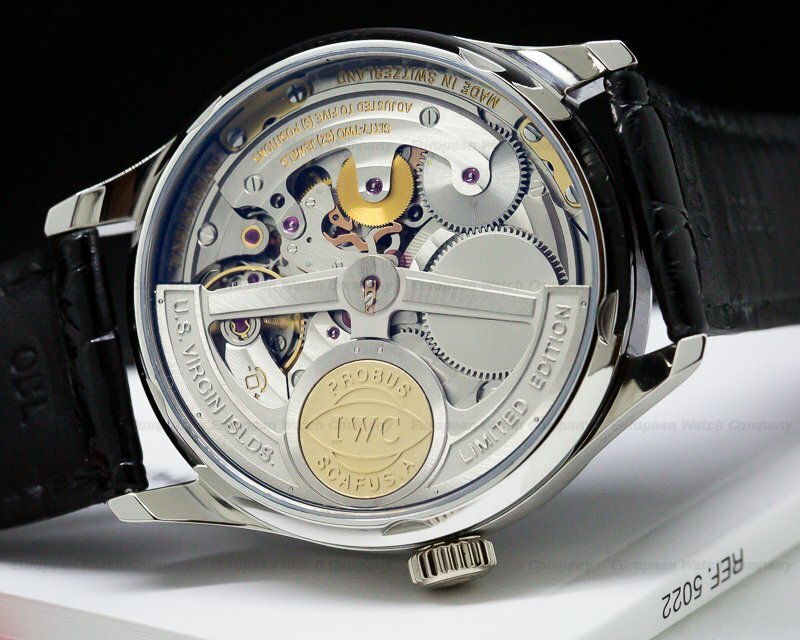 It includes the patented Pellaton winding mechanism with a skeletonized rotor that includes a gold medallion inlay engraved "IWC - Probus Scafusia" (Craftsmanship from Schahausen). 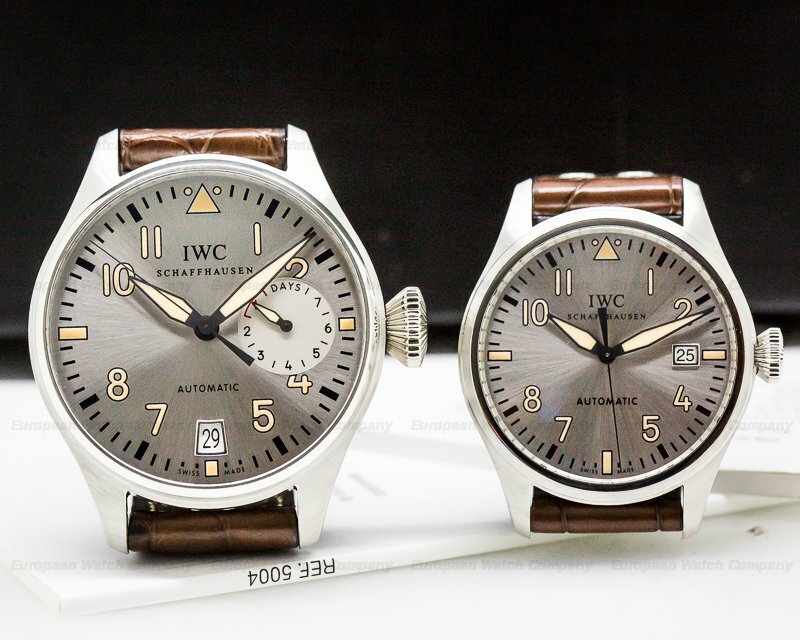 IWC Portuguese Perpetual Calendar II Limited Edition IW5022-19 watch was produced in only 250 examples.